Krista Finstad Hanson, a local writer, historian and teacher, will present her research findings about largely untold accounts of Japanese Americans’ efforts to begin their lives anew in St. Paul, and the local people that aided these efforts during World War II. Ruth Nomura Tanbara and her husband Earl were the first formally resettled couple in Saint Paul. She had worked for the International Institute in San Francisco and they were able to leave the coast in August of 1942 with special travel documents. 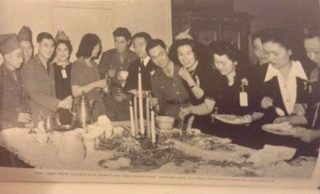 They came to St. Paul and began working here to help resettle Japanese Americans. Eventually the Tanbara and Nomura extended families were resettled to St. Paul, among many others. Featured image: Photograph was taken at New Year’s Eve at the YWCA in downtown St. Paul, 1942. Hosts are Earl (7th from the left) and Ruth Tanbara (4th from the left). The guests pictured are resettled Japanese American young women and Military Intelligence Service soldiers training at Fort Snelling. From Around the World In St. Paul by Alice Sickels, University of Minnesota Press, 1945. Krista Finstad Hanson is the author of two travel guides to museums in historic houses: Minnesota Open House and Wisconsin’s Historic Houses and Living History Museums. She has also written a children’s science textbook, The Great Barrier Reef: A Natural Wonder. Her writings focus on architectural history, travel, and homes, and since 1992 she has written for such a number of local and national publications. Krista has been deeply involved in local history research through her involvement with the Hamline Midway History Corps. She works part-time as a teacher, part-time as a writer, and full-time as a mom to two kids.